Adventures of a Laura: Day 05; #30DaysWild - Bee Rescue! Day 5 of #30DaysWild has been very autumnal – wet, windy, cold and grey. I went up to one of my favourite haunts, the Lickey Hills (I like to loiter), and I saw a small wet bumblebee holding tightly onto a comfrey leaf, just outside the Visitor Centre. I put my finger in front of it and it crawled on board, not even bothering to wave its legs to try and scare me off, and then I put it on the hands of one of the Rangers so that she could cuddle it and share bodyheat to warm it up. 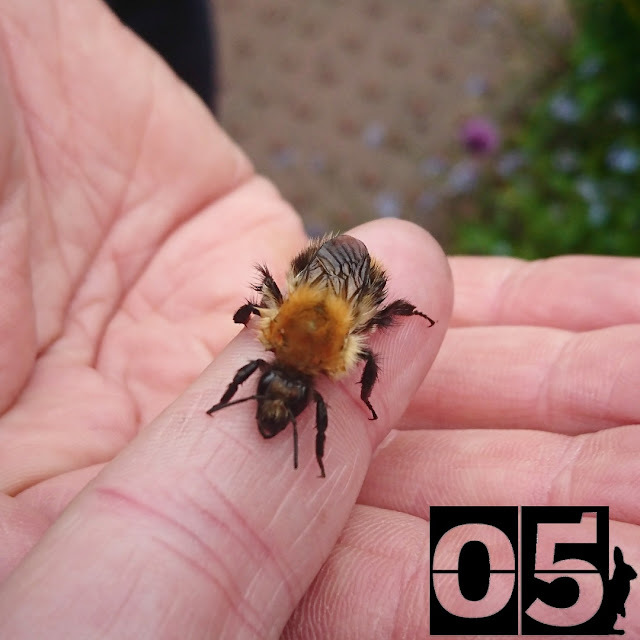 A bee needs to be 30˚C on the inside for its wing muscles to work properly, so if you find a cold and wet bee clinging onto a plant, get it onto your hand (gently!) and let it warm up. It’ll start to move its wings and walk around more. They don’t always need sugar water but it’s a good idea to offer some.